For a lot of Jeep owners, their vehicle just isn’t complete until after they pack it full of accessories. This is especially true for the Jeep Wrangler, thanks to all the different ways its owners put it to work. However, every Jeep vehicle can hold its own, which is why every vehicle comes with its own list of accessories. These are some of the most common accessories, but there are a lot more out there for you to discover. Jeep Wranglers come with floors that are easy to clean, but that isn’t the case for every Jeep vehicle. Many have carpeted floors and simple mats, but you can help make your interior more rugged with a set of all-weather mats. These mats are made of a durable plastic and go up along the sides of the floor area. They collect the mud, dirt, snow, and leaves you track in so your carpeted floor stays in good condition. Washing the mat is easy enough with some soap and a water hose. Top models of the new Jeep Wrangler allow you to hook electronic devices right up to the car, no power outlets necessary. Lower trim levels are also compatible with powered accessories, but you will need some aftermarket parts to make full use of them. 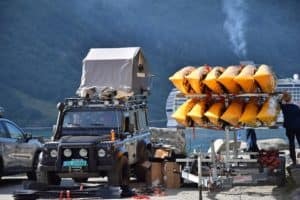 The auxiliary power connections exist so you can hook up specialized equipment like winches or extra lights, but you can also hook up a compatible freezer-refrigerator so that you can have cold food, even when your Jeep has taken you to the edge of civilization. Running Boards fit onto the base of the sides of your vehicle and serve two important purposes. First, by sitting below the sides of your Wrangler, the running boards take the punishment from flying stones and steep, rocky slopes so that the more expensive parts on your vehicle won’t have to. Second, they offer an extra step for getting into the vehicle, and if your Wrangler is extra high up to give you more ground clearance, you’ll thank yourself for making sure there’s an extra step for getting in. Most Jeep Wranglers come with a hardtop. This is a solid metal roof that keeps the weather out and is still fairly easy to remove if you decide to leave it at home. Older models, and some models in the current generation, come with soft tops instead. Soft tops are less durable than hardtops, but they offer some extra convenience because they are easier to remove and are small enough that you can pack them up and take them with you. Jeep accessories offer some interesting customization options, and while the Wrangler has the most, you can customize any Jeep vehicle with a long list of accessories. Once you figure out what you want your Jeep to do, think about what you’ll need to accomplish that, and then come to Westgate for your accessorie needs so you can start having the full Jeep experience.